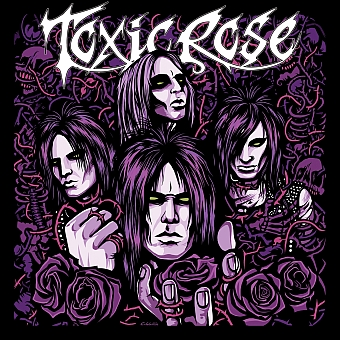 ToxicRose is a new Sleaze-Metal Band from ... Sweden (Where else? It's always Sweden). I've voted their song "A Song For The Weak" already on # 04 in my hitlist of the best songs in 2012. Let's see if the rest of this EP is as good as this single! This EP consists of 5 songs ... yes only 5 songs, but more on that later. Similarities to other bands? For sure! You all know the big names in the sleaze metal genre, but ToxicRose sound more catchy than their colleagues. This is the big advantage that highlights ToxicRose from the flood of swedish sleaze bands. You can sing along with EVERY song after hearing it a first time. I want to point out one song beside "A Song For The Weak" and that's "Follow Me" - what an amazing hymn. This song will work pretty well on stage, because it has a huge chorus. The production delivers sharp guitars and some synthie effects. These fit well into the overall picture. What I have to criticize is that all songs sound a bit similar. It rarely hurts, because of the high level of songwriting, but it's definitely to mention. Also the vocals are good but just typical for this kind of music. "I Drown In Red" and "Don't Hide In The Dark"??? These two songs were released some months ago to promote the band, but why these great tracks don't appear on this EP? I hardly miss them. They would stretch the playtime to 30 minutes, which is a good value for an EP. That's a bit annoying. Under the bottom line we get five very good tracks and I'm sure we will hear a lot of this band in the nearer future. I Can't wait for the first full length album!